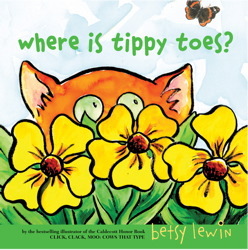 NC Teacher Stuff: Where is Tippy Toes? Tippy Toes the cat has a full day. The mouse needs to be annoyed, followed by an escape from the squirting of the garden hose. A nap in an open dresser drawer gives our frolicking feline the energy to tippy toe in a blueberry pie. Why he would do this is a mystery, but the greater riddle is what happens at night. Where does Tippy Toes go and what does he do? Only one person knows and they're not telling. Where is Tippy Toes? is a pleasant picture book with colorfully sweet illustrations and cut pages that reveal the answers to several mysteries. I think it would make a nice companion to Where is Catkin?. You could draw a Venn diagram and compare both books. This book, with its rhymes, would also work well for a shared reading experience. Another possible extension activity would be to have students explain, from Tippy Toes's point of view, why he tiptoed through the blueberry pie. You could cut a large circle from blue bulletin board paper (in the shape of a blueberry pie) and have a shared writing activity or have students write independently. This sounds like a perfect storytime book, or one to take on preschool outreach visits. Thanks for bringing it to my attention. I hadn't seen it yet. Thank you for stopping by, Lisa! I think preschool would be a great age for this book. So many connections to be made.